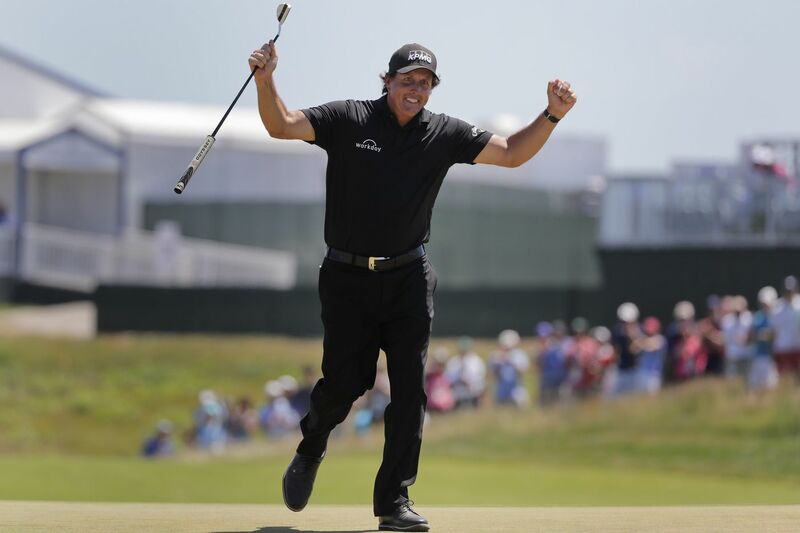 Phil Mickelson reacts after sinking a putt on the 13th hole during the final round of the U.S. Open. SOUTHAMPTON, N.Y. — Don't like what you saw from Phil Mickelson at the U.S. Open? In the third round, putting for bogey after missing the 13th green twice, Mickelson ran from one side of the hole to the other and intentionally putted his ball back toward the hole while it was still in motion. He almost made that putt, but needed two more. Afterward, he not only admitted that he broke the rule to save himself from making a worse score than the 10 he earned — 8 strokes plus a 2-stroke penalty — but also that he had he been planning for years to break the rules that govern the action. The USGA used the more benign of the rule interpretations at its disposal, which kept Mickelson from being considered for disqualification. Mickelson's shenanigans outraged the golf world. Then he said it might not be the last time. "I think the real question is, what am I going to do next?" Does Lefty have more "strategic" manipulations of the rules in mind? Will he will use this particular illegal and unseemly strategy again? The component of Mickelson's misadventure Saturday that most alarmed his peers was that he'd planned it. If this was the real world, that would be first-degree murder … of golf etiquette, of the spirit of the rules and, by association, the spirit of the game. He might never recover. At 48, having won five majors and the hearts of millions, Mickelson is considered golf's greatest ambassador. He is latest in a line of brilliant, talented gentlemen that runs from Bobby Jones to Arnold Palmer to "Lefty," a West Coast matinee idol with a dazzling smile, flowing hair and the perfect family. It's hard to imagine Bobby Jones or Arnold Palmer running across a green to intentionally take a penalty with the intention of saving a shot to two, especially at the U.S. Open. It's inconceivable that they would have spent years planning such a breach of sportsmanship. Mickelson left the 13th green at about 2:30 p.m. Saturday, and the USGA spent the next 18 hours trying to salvage its image, and his. Mickelson was blasted by retired pros, golf analysts and Aaron Baddeley, one of his fellow competitors at Shinnecock. The USGA, pilloried for its complicity, held two news conferences Saturday to defend the ruling (and the setup of the golf course for Round 3), then issued a statement Sunday morning that included another, equally dubious explanation of why it didn't disqualify Mickelson. Mickelson had finished 17-over Saturday, which tied him for 65th, one shot ahead of last place. That gave him the third tee time Sunday, at 8:43, with his buddy Rickie Fowler. In benign conditions, with freshly watered greens at treacherous Shinnecock Hills Golf Club, he shot 1 under and finished the tournament just after noon at 16 over. That included par on No. 13, after which he raised his arms in a mocking celebration. Afterward, he said, "Oh, my goodness. I think I got 'most improved.' "
This dismissive attitude comes on the heels of Mickelson telling anyone who disagreed with his infraction Saturday to "Toughen up." Mickelson has legions of fans, but he did not win himself any more this week. His reaction after his par putt fell at No. 13 recalled Mickelson's most celebrated celebration, after he sank a putt and earned his first green jacket, in 2004. "It looked like he won the Masters," Fowler said. "He didn't jump [Sunday], but he had a little celebration there." There is little for him to celebrate at this year's U.S. Open, the tournament Mickelson most wants to win. It would give him a win in all four majors and make him the seventh man to complete the career grand slam. He has finished second a record six times. But now he is 48 and his U.S. Open legacy will be highlighted by a premeditated rules infraction at the grandest course in America. Mike Davis, the USGA CEO, said Saturday night that Mickelson called him to ask if he should have been disqualified, to which Davis replied no. Davis said that Mickelson implied that he was considering withdrawing. Mickelson did not address either of those issues. In fact, he responded to only three questions, and those were thrown at him as he hustled off the scene, like a man on trial descending the courthouse steps. It was just one more surreal moment in the career of Phil Mickelson. He spent 25 minutes in the scorer's hut, kibitzed with family and friends for 10 more minutes, signed autographs for 30 minutes, then refused the USGA's request for a proper interview session and scampered off like a scalded cat. Two uniformed police officers and his burly manager ran interference, jostling reporters as Mickelson walked briskly past the driving range toward the player's hospitality tent, which is off-limits. On his way, he complimented Fowler's fine play and said, "It was a good day." It felt like anything but. And it sounded like more bad days might lay ahead.